Working with blood is sticky, messy and oodles of fun. Here are some things to consider when working with the gloopy red stuff, a kind of blood makeup tips for the vampire in all of us. Ponder. We like that word. Anyway, if you’ve watched Dexter or CSI, you’ll know there’s a whole science behind blood pattern analysis: how blood lands, its consistency, the size and shape of the blood droplets – all giving investigators clues to what happened. While we’re not going to get this deep, there are things to consider when using blood to add to the realism and believability of the final effect and to make your life as simple as possible. Think about the situation and how the bloodiness occurred. Was it because of a fall, stabbing, grazing, bomb blast, or is it someone else’s blood? This influences how the blood would look (i.e. running, drips, scratches, splattered, smeared etc. ), how much blood would be involved and, ultimately, what products are best to use to create this. Some parts of the body bleed more than others, and different wounds bleed in different ways. Also, the oxygenated blood from an artery is lighter in colour than the darker red blood from a vein. How Old is the Blood? Is it a fresh wound requiring fresh running blood, or old enough to have congealed, dried or scabbed over? Different products are made for all your fresh, dried and scab blood requirements. Where is the Blood Going? This is relevant for health and safety reasons. For example, if going in mouth, can the blood used be ingested? If someone is diabetic, many blood products are sugar-based, so use an alternative. What is the Position of the Victim? 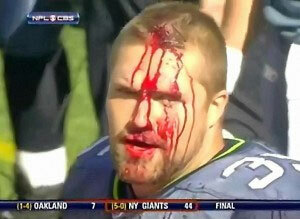 Blood from a head wound finding its way around facial contours and flows down – thanks gravity! Are they lying down, upright or face down? If they are found lying down, think about their posture and the effects of gravity – the blood needs to be applied to flow in the right direction. Is the actor moving around during the take and, if so, will they transfer any of the blood to another actor, costume, props, the floor and so on? Some bloods are not costume friendly, so liaise with the costume department if you think blood could get on the clothing. Blood doesn’t run in a straight line – it goes around the contours of the body, drops off the end of the nose and chin to create splashes. Drop blood from a pipette or brush end to allow blood to find own path rather than paint it on – chances are it will look painted on. NEVER USE REAL BLOOD UNDER ANY CIRCUMSTANCES! There are lots of great products available for all situations to help us create congealed blood, wounds, scabs, scratches and fresh blood effects. Blood products come in liquid, dried and paste form in a variety of tubs, capsules and bottles from the various manufacturers. You can also make your own blood; we cover that in a bit. Liquid comes in containers large and small. It comes in different colours, like “arterial” and “venous” blood. Makers of blood include the popular Pigs Might Fly (usually safe on costume too), Maekup, Ben Nye and Kensington Gore. This is the blood to use for fresh injuries and to create fresh pools of blood. A loose invisible powder activated by water. Can be used to create “live wounds”; e.g. apply a thin layer of petroleum jelly to the skin for the powder to stick to and use a wet weapon to activate the powder, creating blood. Ben Nye and Makeup International make powdered blood. These go in the mouth and, when bitten, they release the blood. Good to use where blood has to appear in the mouth during a scene, as the actor can bite the capsule to release blood. There are pre-filled capsules (with powder which mixes with saliva to create a blood effect) and empty capsules to fill with a blood product. The capsules are made from gelatine, therefore, they will gradually dissolve in the mouth, so be aware of timing. Kryolan and Ben Nye make blood capsules. There are also blood sachets on the market. These ere also for the mouth. Use just like normal blood capsules. As well as producing blood, they also create a frothing effect. This sprays out of its bottle to create a splattered effect. Good for any incident that requires a splattered blood look. You can also create splatter by flicking blood off the bristles on a stumpy brush; just make sure the actor has their eyes closed first and you’re not going to get blood on anything that shouldn’t have it. Eye blood is used to create a burst blood vessel red eye look and is safe for using in the eyes. Kryolan make eye blood which comes in a handy dropper bottle. It isn’t long lasting so has to be applied frequently. Don’t use regular makeup blood products – some contain ingredients that can really bloody sting, plus they are not meant for eyes! Coagulated blood products are for that difficult teenage stage between fresh blood and scabbing. These products are thicker than liquid blood, blobby and slightly darker, creating that thick jelly-like coagulated phase. 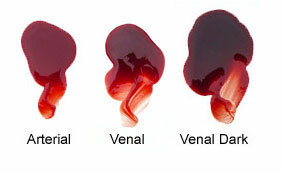 Wound filler comes in different shades of red, from a raw flesh colour to a darker red. They tend to be thick pastes that can be applied directly to skin and prosthetics. Some are waterproof and last a long time. Brands include Glynn McKay, Maekup and Ben Nye. These products are used for creating scabs, scratches and dried blood effects. They are darker in colour than fresh blood products. Fixblut by Kryolan is good for scratches – it dries quickly, so don’t dawdle, and lasts quite well. Whatever products you use, check that they are right for the purpose you require, especially for using in the eyes and mouth. Some products are waterproof and long lasting; others are more easily removed and need watching and reapplying regularly for continuity. If you’re doing something low-budget, knowing how to do a bit of SFX DIY can go a long way. Food items like breadcrumbs and cornflakes can be added to blood to create good effects. A last-minute request from a director once meant mashing up a banana into some gloopy blood for an effective gunshot exit wound explosion effect. And it was delicious! We haven’t specified exact quantities, as it will vary depending on the brands used and end quantity needed – plus as a makeup artist you should be able to use your eyes! When adding the food colourings and condensed milk, go slowly, a few drops at a time, and test it continually against your blood reference. You can always add more, but you’re screwed if you add too much! Also, this recipe is highly likely to stain costumes and other absorbent things, and possibly your skin, so test first! Put the syrup into the container. Gradually mix in the red colouring until you have a good red colour going throughout the syrup. Gradually mix in drops of yellow and blue food colourings to get that red-brown blood colour (remember your colour theory and use your reference!). Add a few drops of washing-up liquid—we find this helps with the viscosity and how the blood stays on the skin. Adding condensed milk to the mix creates the opaque quality of blood (syrup is translucent – blood isn’t). Add hot water as necessary to thin the mixture (especially if going through tubes!). Test continually, tweaking the colour as you go. Blood in the mouth. If you don’t have capsules, use a piece of bath sponge soaked in blood suitable for use in mouth. The blood will mix with saliva and creates a nice consistency. Vomited blood. For fresh internal bleeds, use liquid blood suitable for use in the mouth. For the blood-clot look or melena, add coffee grinds to the liquid blood. Blood bags. Can be made cheaply from a whole of things like condoms, food bags or the fingers from rubber/latex gloves. Just fill them with blood, secure the opening and they can be squeezed or popped at the right moment to release the blood. We once created a “gouge out your eyes” moment on the cheap by glueing the finger tips of latex gloves to the actor’s thumb pads, leaving the top part of the edge unglued, and filled them with blood using a tiny pipette. The blood splurged out under slight pressure. Gouge-eous. Keep a blood in place. If you need a drop or run of blood to stay in place, add blood to a gelatine-glycerine mix to make it set without losing its fresh look. To make, pop gelatine into hot water (or whatever the instructions tell you) and simply add a few drops of glycerine. This will create a smooth jelly. You can create drops or runs of blood, allow it to set, then place when needed. There are two chemicals that work together to create a very authentic-looking dark red blood. It can be used to turn “water” into “blood” – so handy to create a blood trickle from a weapon, produce a stigmata right in front of your eyes, or anything else that requires blood to suddenly show from nothing. You need: two glass vessels filled with water, potassium thiocyanate and ferric nitrate. To one water-filled vessel add potassium thiocyanate (the water stays clear). To the other vessel add ferric nitrate (which creates a straw-coloured solution). When the two solutions come into contact, blood magically appears. It’s all to do with the iron and, heck, that’s part of the reason why blood is red! So, to create a bloody knife cut, apply the potassium solution onto the body where blood is to appear. Dip the knife (a blunt one of course) into the iron solution. When the knife is run down the skin, blood will appear. Magic! Use containers. Blood has a habit of getting away from its container if you’re not careful – leaving a lovely red sticky mess in your kit bag. Always use containers that have a tightly sealed top and keep it in a zip-lock or plastic food bag for extra protection. Use plastic bags. Put all tools (brushes, pipettes, sponges etc.) used for your blood effects in zip-lock baggies – easy to replace when they get mucky and keeps the blood away from everything else. Have an ample supply of wet/baby wipes and tissues with you – blood products are sticky and messy! Keep products at right temperature. If working in a hot climate, put blood products into a cool bag and keep out of the sun. Likewise, if working in cold conditions, blood products can thicken with the cold, making them less likely to run/work. Keep them at room temperature. Finish blood effects in situ. If dealing with a running blood effect, work with the actors in situ to get the blood running in the right direction. Let the AD know that you need time on set to finish the makeup. Do not cross the department line. Do not put blood on props, the set or costume without express permission from that department. Sometimes blood effects are a team effort, so absolutely liaise with others, and don’t cross the department line. One day we will cover blowing the crap out of things to create gunshots and bloody explosions, but we’ve covered enough in this post and frankly all this talk of blood has made us hungry.